Andrea Holwegner is an award winning writer, health & wellness leader that delivers nutrition, energy and productivity solutions as a keynote speaker. She has counseled hundreds of individuals, including Olympic athletes, CEOs and families on the benefits of healthy eating. Andrea Holwegner leads a team of highly trained and experienced dietitians in her practice. Known as the “chocoholic nutritionist”, she believes anyone can achieve health without guilt, and that the secret to success is having fun. 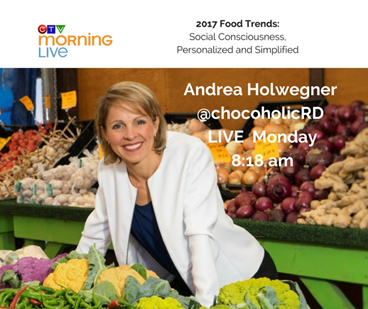 Andrea Holwegner is one of a handful of Registered Dietitians in North America that is a qualified and entertaining speaker. She knows how to deliver relevant content, mixed with humour and fun to capture corporate, association and government audiences. She is a highly credited with a Bachelor of Science degree in Nutrition & Food Sciences and Dietetic Internship from the University of Alberta. A certified Craving Change expert that specializes in strategies for problematic and emotional eating. Andrea Holwenger is a Member of the Dietitians of Canada, the College of Dietitians of Alberta, Restaurants Canada and the Canadian Obesity Network. Due to her expertise, Andrea Holwegner is a media expert for the Dietitians of Canada and a recipient of a regional award by the Dietitians of Canada: the Speaking of Food & Healthy Living Award for Excellence in Consumer Education. Andrea Holwegner’s simple ideas elevate productivity, work-life balance and health. Andrea is a columnist for The Calgary Herald. She also is an on-air expert for QR77 Radio, Global Calgary Morning News and CTV Morning News. She has written articles for CBC News Online and is a Member of the Chatelaine Health Advisory Board. Andrea was a dietitian on the Life Network’s popular reality weight loss show “Taking it Off”. She has appeared on CTV National News and CBC News Today Newsworld. In addition, CBC Radio has also interviewed her in almost every province in Canada. She has counseled Team Canada Olympians and leads a team of Registered Dietitians at her practice. She is also a media spokesperson for the Dietitians of Canada. As a result of her experience, achievements and expertise, Andrea consults and advises Jugo Juice and Bright Path to improve their nutrition and health focused strategies. Most of all, Andrea Holwegner delivers powerful presentations with a balanced message regarding health and good living. Holwegner is a foodie, a die-hard chocoholic. Andrea is happily married to a wine importer that is a “meat head”. She has the ability to translate the complex science of medicine, nutrition and health into easy to understand strategies. As a result, Andrea provides easy steps and simple solutions for busy people that want to look and feel their best. The topics of health, nutrition, stress management and productivity are especially relevant to the success of your workplace. Health and Nutrition have a direct impact on health benefit costs, employee absenteeism, safety concerns and lost productivity. Andrea Holwegner teaches audience members how to become healthier, happier, less stressed and more productive by sharing her knowledge and expertise on increasing health and nutrition awareness. Improve productivity; reduce stress & burnout. We all want to be healthy, productive and manage stress effectively. At the same time we are juggling more responsibilities than ever before. Heavy work schedules and busy family commitments increase stress, lower our resiliency and sacrifice productivity. As stress and exhaustion take over our nutrition suffers and personal health can take a hit. Add the challenges of conflicting and over-complicated health information and we can become overwhelmed. The good news is there are simple solutions to starve stress and manage productivity through your workday so that your family-life and hobbies get the best of you. Andrea will inspire you with easy steps to take charge of your everyday eating habits that even the busiest person can do. As the chocoholic nutritionist, Andrea Holwegner will show you that the secret to successful health is flexibility, never taking things too seriously and having fun. Andrea Holwegner has a mission to help you achieve health without guilt and complexity. Food and eating is much like life; when you are having fun, you will be successful. You don’t need complicated plans and a huge amount of time or resources. You also don’t need to sacrifice your favorites to improve your wellness. Nutrition plays an important role in preventing and reducing obesity, high cholesterol, high blood pressure, diabetes, depression, stress, burnout and more. Andrea Holwegner will discuss the most important changes you can make to what or how you are eating that has profound changes to your health, energy and weight management. Andrea will wrap relevant content and solutions in an entertaining, humorous session and show you that you can achieve more of what really matters to you in your life. Better health, life balance, stress management and workplace productivity are all within your reach. You will enjoy her refreshing approach that you needn’t be perfect to achieve good health. Less Stress & Stealth Health: Why burgers and fries are your secret weapon. Improved workplace wellness, culture, stress management, productivity & safety. This session is a perfect fit for male audiences with demanding, high-stress jobs that are looking for a relevant content-rich session that is also FUN. Yes it is true – burgers and fries with your buddies can actually keep you healthy! You don’t need to be perfect in order to achieve good health. In order to be successful you need to be flexible and have fun! Andrea has a mission to help you reduce stress and achieve health without guilt and complexity. As the Chocoholic Nutritionist, Andrea Holwegner delivers realistic and balanced messages regarding health and good living. She is a foodie, a die-hard chocoholic and married to a wine importer whose carnivorous eating habits have earned him the nickname “meat-head.” Andrea is best known for her energy as well as easy steps and simple solutions for busy people that want to look and feel their best. Andrea has the ability to translate the complex science of medicine, nutrition and health into easy to understand, relevant strategies you can use immediately. Outside of inspiring better personal health, Holwegner also inspires delicious ways to improve workplace satisfaction. She advocates that food builds relationships and that any organization can build better workplace culture, productivity and profit simply by eating together. Enhance credibility, visibility & sales. Everyone wants to be healthy yet more people than ever before are struggling with obesity, health issues and guilt about their food choices than ever before. People become overwhelmed because of the challenges customers face from the negative perception of the food/restaurant industry and over-complicated health information. How well do you understand the needs, buying decisions and questions of health conscious consumers and those with medical issues? Are you coming up with ideas that will satisfy a hungry market that is starving for better solutions to their needs? Do you know what key opinion leaders that educate the public about health and wellness every day will say about your offerings and marketing material? Contemplating these questions is important for product innovation, marketing and communication of your current and future offerings. When you create choices, partnerships and credible education for this population that not only deliver taste but also you surprise them with solutions for their health, you will create a new following of loyal supporters. Enhanced workplace wellness, health & safety programs; improve employee health & productivity. Nutrition is one of the most important yet neglected components of health and safety initiatives and workplace wellness programs. This session will boost your knowledge on nutrition to enhance employee health and productivity. Nutrition plays an important role in preventing and reducing obesity, high cholesterol, high blood pressure, diabetes, depression, stress, burnout and more. Supporting healthy employee eating habits also plays a role in reducing the high cost of employee benefits, medications, sick leaves and poor productivity. Nutrition is one of the most important areas you need to focus on to address unfavourable results in health risk assessments and biometric screening. Andrea will review top strategies for HR professionals to use when building successful nutrition initiatives in your workplace. Andrea Holwegner will discuss what organizations can do to improve the cardiovascular health, weight management and productivity of their employees through nutrition. Holwegner will also discuss case studies about initiatives that are working to shift nutrition habits in the organizations she is working with regularly. Andrea has a mission to help organizations achieve health without guilt and complexity. Food and eating is much like life; when your team is having fun, they will be successful. Your employees don’t need complicated plans and a huge amount of time or resources. They also don’t need to sacrifice their favourites to improve wellness. You will enjoy her refreshing approach that you needn’t be perfect to achieve good health. Power Nutrition for Women Look & Feel Your Best! Improve Health, Body Image & Wellness for Women achieving good health doesn’t mean sacrificing your favorites, spending hours cooking or studying complicated nutrition books. Learn quick, healthy ideas to promote optimal energy levels, manage your weight and feel your best. Explore the most important nutrition issues concerning women and strategies to improve your health as well as the health of your whole family. Get inspired to live fully (both healthfully and soulfully) and improve your relationship with food and your body to live a more satisfied, happier and healthier life. Improve practical skills in healthy meal planning to reduce stress. Engage and Motivate Employees in Workplace Fitness Programs. Learn the key concepts of sports nutrition that will maximize your workouts. Understand the role of carbohydrates, protein and fat for sport and fitness. Review hydration and discover what to fuel your body with pre-workout to get the maximum benefit from your training. Explore options for your post-training meal: the most important meal of the day for an active person! "Andrea Holwegner brings huge value and return on investment as an inspiring leader in the nutrition field. She is an upbeat speaker, with credible, practical ideas to share. We have continued to bring her back again and again to speak to our employees. Her message is starting to stick! Our employees are starting to "walk the talk" and as a result of eating better, are returning to work feeling healthier and more energized." "I wish to sincerely thank you for participating at this year's Freshables Conference, your topic and your presentation was just what the Doctor ordered being that the focus was on Health & Wellness at this year's event. Your message and your energy inspired all that attended. Your execution was spot on while at the same time left us wanting more of what you had to offer. In today's fast moving economy and hectic lifestyle you brought home a realistic action plan for real personal change as well as solutions that can target real sales growth in today's Food Retail environment. I applaud your ability to coach and mentor and most importantly your infectious humour and great passion for what you believe in. Andrea, it's my pleasure to endorse you as a true professional." "Andrea Holwegner was a guest speaker at our annual retreat and was great! Addressing a full room of doctors to discuss nutrition is a challenge, I am sure...but Andrea hit the mark by teaching us about the psychology of eating...the why and how it is that we ignore what we know about health...much more useful than a lecture on food. She was fun and engaging and the information she gave us was very, very relevant to all of us. Thank you Andrea!" "Andrea is not only a wellness expert but also an engaging speaker that has stirred up positive change in our team. As a group of busy professionals with very demanding jobs, we appreciated Andrea's practical, not perfect approach. She enthusiastically led our half-day offsite retreat with relevant strategies to improve our nutrition, health and productivity. Each of us took away simple tips that could be implemented right away to help us manage stress and improve how we perform in our professional and personal lives." Carrolyn Schmid & Jacky Chan, Senior Advisors, Corporate Controllers Group, Enbridge Inc.
"Andrea, your high energy keynote session delivered at our conference was right on target! Your positive contagious energy and humour generated optimism with our group. Your stories and practical tips not only captivated the attention of our group, but inspired us to take charge of our health. We learned that eating well doesn't have to be difficult, and that small changes can really make a difference in how we feel at work every day. Your fresh approach to healthy eating and philosophy that all foods can fit really allowed you to connect with the audience. We look forward to having you speak to our group again. Thanks!"